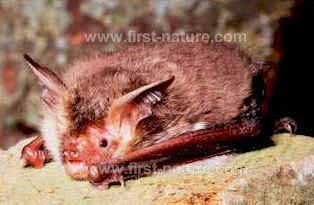 Bechstein's bats are very rare, and most recorded sightings have been in winter. These medium-sized bats have a head-and-body length of 4.3 to 5.3cm and weight between 7 and 13gm. 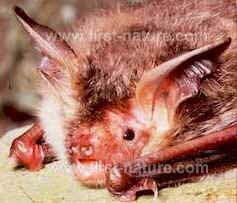 Bechstein's Bats have long, pointed ears and long, pinkish faces; they are quite easily distinguished from other bats found in the British Isles. You may be lucky enough to see Bechstein's bats beside coniferous, mixed or deciduous woodland, where they feed on moths, beetles and other flying insects. On mainland Europe, Bechstein's bats are known to have summer roosts in trees and occasionally in buildings, and occasionally they make use of bat boxes. They have small maternity colonies of between 10 and 30 individuals. Bechstein's bats are sometimes found in underground roosting sites in Britain during the winter, where they hang freely. Experts believe that these rare bats may also roost in trees during their winter hibernation, a period between October and March or April.